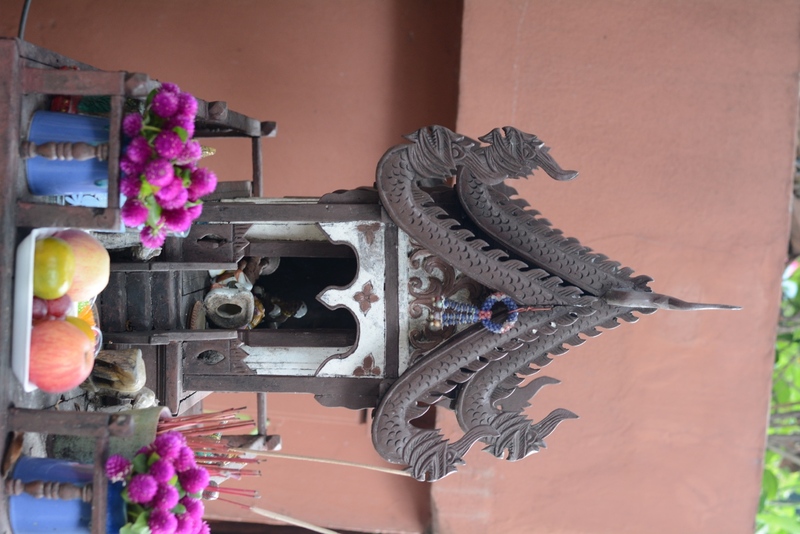 One of the many Thai “spirit houses” that are outside of private and public establishments, and given daily offerings to appease mischievous spirits. As my time in Thailand comes to a close, it’s becoming increasingly difficult to fathom returning home to the states. As I’ve adjusted to my routine here, I’ve wondered what my culture shock coming back home will be like. I now expect meals out to be $2 or less when going out, traffic to be on the left side of the road, and people to not natively speak the language that I do, but nonetheless be kind and try to understand me. English class at Back Back office. 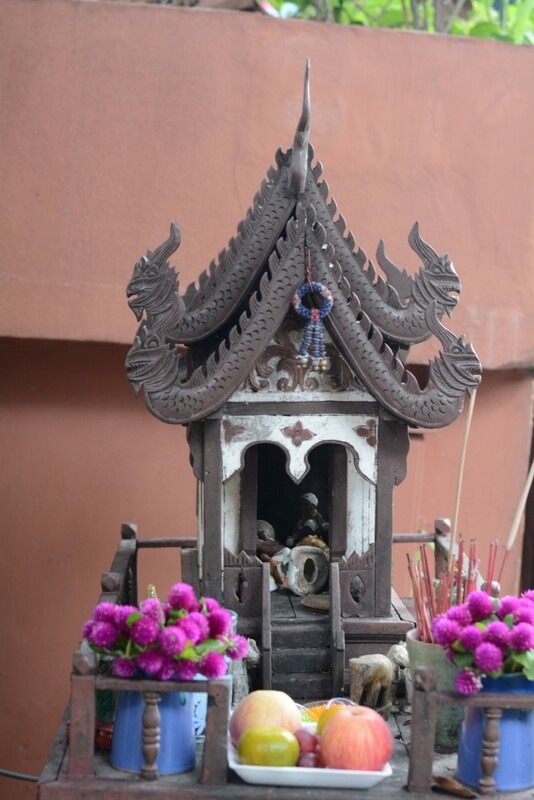 I have spent the past several weeks on a GROW (Grassroots On-Site Work) internship affiliated with Burma Humanitarian Mission, which funds several nonprofit organizations that aid ethnic minorities and refugees from Burma. I am here with three other Whitman students. 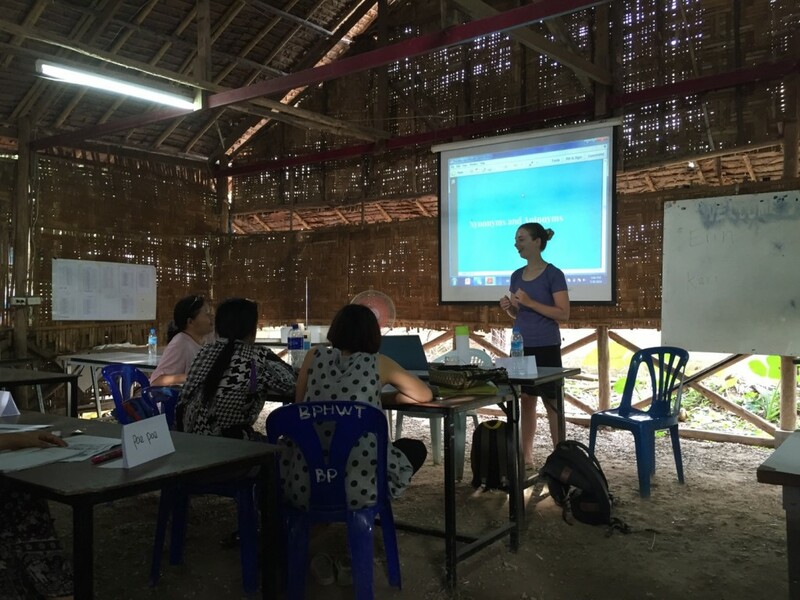 I am primarily working with the Back Pack Health Worker Team, as well as teaching English classes at Minmahaw School, a 2-year school for disadvantaged young adults from Burma. Working for these two organizations has helped me develop skills to navigate different cultures, and begin to refine my leadership skills according to the situations I have been put in. This has become especially important at the Back Pack Health Worker Office, as a privileged and young westerner coming into a workplace ran by Burmese people, for Burmese people. The Back Pack Health Worker Team is comprised of over 100 medic teams, who promote community-based health care in affected Burmese populations by providing medical supplies and health education. I work primarily with those who are at the main office, located in Mae Sot. There, the Back Pack medics receive training, deliver 6-month reports on their projects, and hold staff meetings. 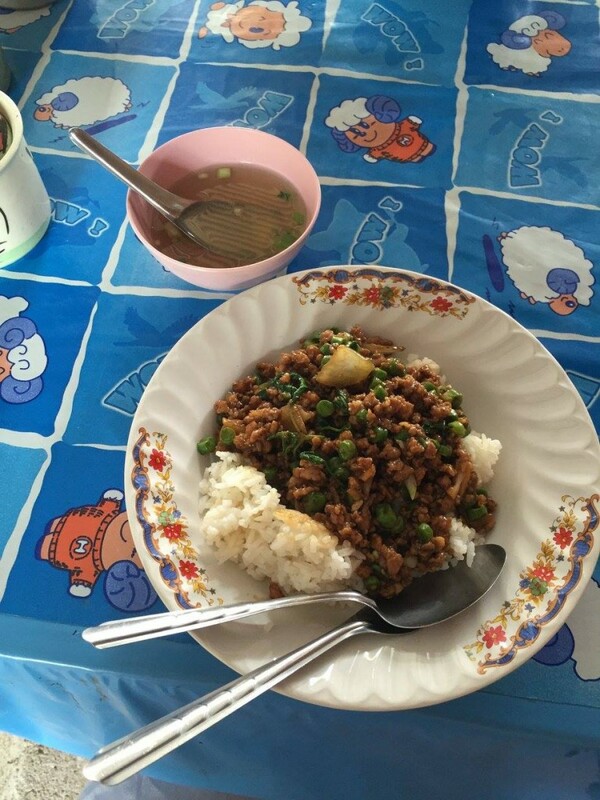 My favorite Thai-style meal, Pad Kra Pao. My role at the Back Pack office has been twofold: to develop a social media platform by filming interviews of the medics about their experiences, as well as to plan and teach an English class for those who work in the office. Developing ways to respectfully ask field medics about their experiences in Burma has been a constant learning process. From navigating language barriers to knowing what questions to ask to get the right answers, I have heard stories of a medic who has delivered numerous babies in the Burmese jungle to one medic who has performed over 150 emergency amputations. These stories were difficult for the medics to tell – not because of any sensitive nature, but that the medics considered it a normal aspect of their job, and didn’t think of it as important enough to recount. Now having the footage, I and my GROW team are making videos for the Back Pack office to use in their various social media. To make this sustainable, we are helping assist someone to take over the accounts when we leave. The Back Pack Health Worker Team has been our GROW internship’s primary focus this summer, and it has been rewarding to get to know the staff members by name, and become more personable. I recently was asked by a staff member, Thaw Thi Paw, to help write a bi-annual report about a family planning project in the Karen State in Burma. I was able to synthesize the data collected by Thaw Thi Paw from field medics, and help write an English report to send to the NGO funding the project. Back Back was able to report that the NGO’s funding had provided IUD’s, implants, and depo injections to over a thousand women in the Karen State, making family planning available and affordable. I was able to be directly involved, and in doing so it helped me to understand the impact Back Pack can have on their own communities. 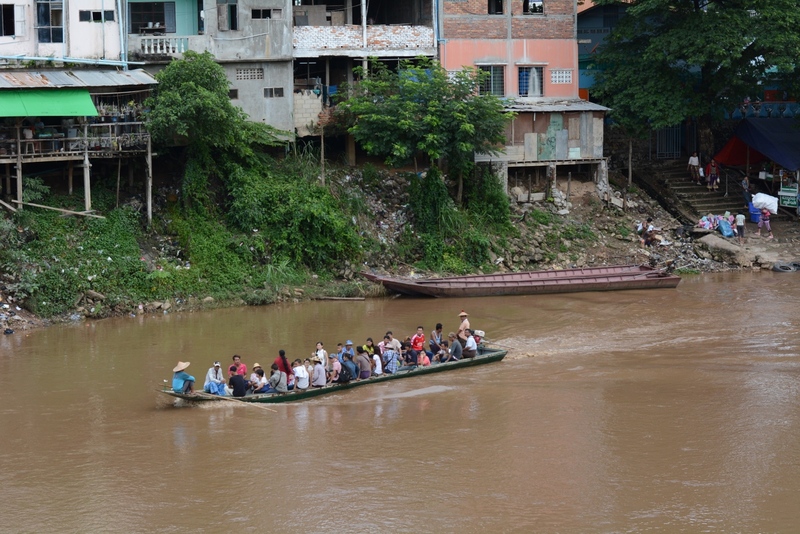 Burmese people crossing the border into Thailand via boat. The houses pictured are in Burma. By coming to the Thai-Burma border, I have been challenged in the ways I think about privilege, power, education, and access to healthcare. I’ve realized the power of upward mobility and seeking to give help in the most sustainable way possible, in order to facilitate change for future growth and stability for the future of Burma, particularly by creating and sustaining opportunities for employment and education. The Back Pack Health Worker Team as well as Minmahaw School are two excellent examples. While it will be hard to say goodbye and come home, I am looking forward to bring back what I have learned to the Whitman community.